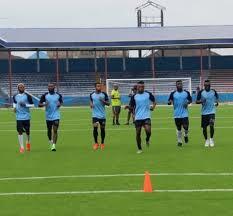 Enyimba are doubling efforts in training ahead Sunday’s clash against Djoliba . – Royal Times of Nigeria. Confederation cup campaigners Enyimba are doubling efforts in training in preparation for Sunday’s clash against Malian side Djoliba in Bamako. The two-time Champions league winners occupy the third position in Group C with six points, same points as second placed Carra Brazzaville who however boast of better goal difference. Group leaders Williamsville Athletic Club (WAC) are on Seven points and a billed to face Carra Brazzaville same Sunday. Enyimba were hosts of WAC last month but managed a lone goal victory only to lose by two goals in the return leg. Sunday opponents Djoliba equally lost away by a lone goal to Carra Brazzaville going into Sunday’s match. Although the Coach Sidi-Usman Abd’Allah led side still have a home game against Carra Brazzaville on August 28, fans of the Aba based side are hoping the boys can up their game in Bamako to stand a chance of turning the table and progressing from the group. The 7-time Premier league winners took to the social media Wednesday to reveal their readiness for the all important clash.